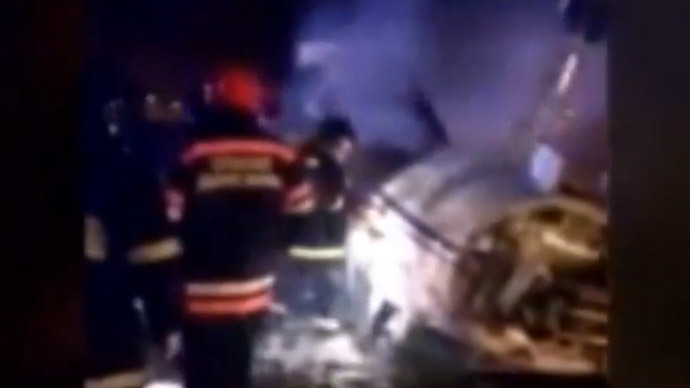 Video footage of the Moscow plane crash that killed Total CEO Christophe de Margerie has emerged. The aircraft attempted a takeoff from Vnukovo around midnight, failing and crashing into a snowplow. The video shows emergency workers sawing away at the fuselage, which appears to have split in half, following the collision and resulting crash. Debris is strewn around amid the overnight commotion. Investigators are at the scene examining evidence, taking fuel samples and talking to personnel. Two main theories as to the cause are being considered at this time – an air traffic control error and the actions of the snowplow driver, Vladimir Martynenkov. It has been determined at this time that “the driver of the snowplow was under the influence of alcohol,” spokesman of Russia’s Investigative Committee Vladimir Markin told the reporters on Tuesday. However, the man's lawyer denies that that was the case. He told reporters that his client "is suffering from an acute heart condition; he does not drink at all and his relatives and friends can testify to that." He also said he will insist on an independent alcohol test. If proven guilty, the sentence for the driver under Russian law could be up to seven years in prison. It has also been revealed that the taxiing shortly before the crash was being coordinated by a traffic control intern, RIA Novosti was told by a source inside Vnukovo. The official spokesman for the airport has declined to comment. Deputy Transport Minister Valery Okulov has visited the scene, telling journalists that he has "no words. This is utter carelessness." The sensitivity of the matter has led to Investigative Committee head Aleksandr Bastrykin to hold a meeting with airport personnel and the investigative group, which was now joined by representatives from the Interstate Aviation Committee as well. As a result of the tragedy, the Regional Transport Prosecutor’s Office is to carry out a full investigation of the entire airport and its functioning and will give a comprehensive analysis of its findings. The black boxes are currently on their way to the IAC’s lab facilities, but will not be processed until the arrival of specialists from France. Vladimir Putin has expressed his condolences to French President Francois Hollande. “I am shocked at the news,” the Russian leader conveyed to his French counterpart. “I ask that you offer my sincerest wishes and condolences to the friends and families of Christophe de Margerie – a renowned French entrepreneur, who has helped spearhead a great number of join projects, which have been the source of a long and fruitful partnership between Russia and France in the energy sphere,” Putin continued. The CEO of France’s oil and gas giant Total was the only passenger in the jet, while three crewmembers who were also French citizens perished as well. The French Bureau for Air Crash Investigations (BEA) is sending experts to Moscow to assist with the investigation. The three specialists are said to be arriving very soon, AFP said.